Hall of the Mountain King: Review: Grip Inc., "Incorporated"
When drummer Dave Lombardo parted ways with Slayer in the early 1990s to form his own band, I thought it was a bad move. 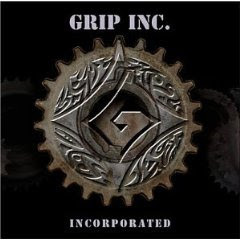 Grip Inc.'s first three releases were good, but not outstanding, and when Lombardo rejoined his old bandmates in Slayer a couple of years ago, it could have signalled the end of Grip Inc. Instead, the band has delivered its best album to date. "Incorporated" is easily the most diverse album the band has done. It has the same mix of Slayer-style thrash, punk and progressive, but every time you think you've got it figured out, the band throws in something new. They add some electronic industrial beats on tracks like "The Answer " and "Prophecy." They throw out a little flamenco guitar on "Enemy Mind," and several songs have a Middle Eastern flavor. Perhaps the most surprising touches are the strings on "(Built to) Resist," and the Gregorian-style chanting on "Blood of Saints." What won't surprise you are thrashers like "Endowment of Apathy" and the slab of crunch on "Man With No Insides." They may mix things up a bit, but they haven't sacrificed any heaviness. Review: Aerosmith, "Honkin' on Bobo"
Review: Godsmack, "The Other Side"
Review: Manowar, "Hell on Earth III"